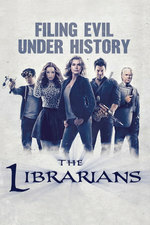 When a secret sect of the Vatican Church unearths an ancient map detailing the locations of the four cornerstones of the Library of Alexandria (the original Library), it's up to Flynn and the Librarians--with the help of an unexpected ally--to stop them before the stones can be used to destroy the Library. Glad to have this stupid show back for another season - a brief one if they plan on running two episodes a week for the whole run again. I just finished a Leverage re-watch before it disappeared from Netflix in November, so, I found Christian Kane's latest hairstyle especially amusing. And I'm assuming John Noble's character will be emerging from that vortex somehow/somewhere/somewhen, or they've just criminally wasted him on such a nothing role. I lost it when they made a Zamfir reference. I sometimes think that I am their very specific target audience. I hope they aren't foreshadowing Jenkins being the Big Bad this season. No, wait, I hope they are. Bad Jenkins would be a hoot.